Ashburton Grove - Arsenal news and Arsenal opinion: Ramsey and Wenger set for bust up? -Rodallega linked - Arshavin's German exit? 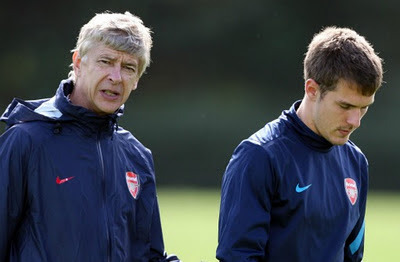 Ramsey and Wenger set for bust up? -Rodallega linked - Arshavin's German exit? Well here we are. Exactly seven days to go until we see the Arsenal play again. It's a stretch, but at least it's not as long as the summer break. If I were to tell you that there was lots and lots of Arsenal news around this morning, I would be lying. Hopefully there is enough to write a post about what is going down. The main news of the day centres around Aaron Ramsey's desire to play for the Great Britain team at the London 2012 Olympics. The 20-year-old won't be going to Euro 2012, so if he is selected to play for team GB it will be his only football tournament of the summer. However playing in the Olympics still isn't great for Arsenal. Ramsey would have to forgo the entire pre-season with the club as that is when the matches are due to take place. "If it doesn’t affect Wales’ identity then I don’t see why not to play for GB. It is up to the players. The PFA haven’t given us any reason why we can’t play in the Olympics. "Maybe we’ll have a meeting, but I am not sure. It is still a long way away, so a lot can happen. "But whenever I put on that Wales shirt I give 100 per cent... I am a proud Welshman, who wants to go out and give his best every time." For me, it seems as though Ramsey has set his mind up that he wants to play. The talk of involving the PFA, is to me, a warning to Arsene Wenger that he won't allow the Arsenal manager to stand in his way of playing at the Olympics. For a Welshman at the moment, the Olympics is biggest international football tournament he can be involved in. I can't remember the last time they were involved in the World Cup or the European Championships. So for Ramsey, playing at London 2012 would be massive. Having the chance to win a gold medal doesn't come about very often. So Ramsey is issuing an early warning that he does want Wenger to stand in his way. Is it ideal that he plays Olympic football next summer from an Arsenal point of view? No, not at all. Can Arsene Wenger do anything about it? It appears not. Let's just hope that Ramsey and Wenger don't fall out over the fact the player wants to be involved. I'm sure they won't. Meanwhile in The Sun, they're running a story about how quiet our stadium is. Another stick to beat the club and it's fans with. In my honest opinion, I think the atmosphere this season at the Grove has been better than any other since we moved from Highbury. In other transfer speculation news, Hugo Rodallega is again linked with a move to north London by the Daily Mail. Is he still trying to get more money out of Wigan? And the Daily Mail tell all right thinking fans what we already knew, Sebastien Squillaci and Manuel Almunia are available to buy, at the right price of course. An interesting line at the bottom of that piece is that Schalke are watching Andrey Arsahvin. Could he be off to Germany this summer? And if you fancy some extra reading, catch the latest post in our series about how our summer signings are adapting to life in north London. Joss Bennett focuses on Alex Oxlade Chamberlain's first few months as an Arsenal player. Try and enjoy your Arsenal free Saturday. Tough as it will be.